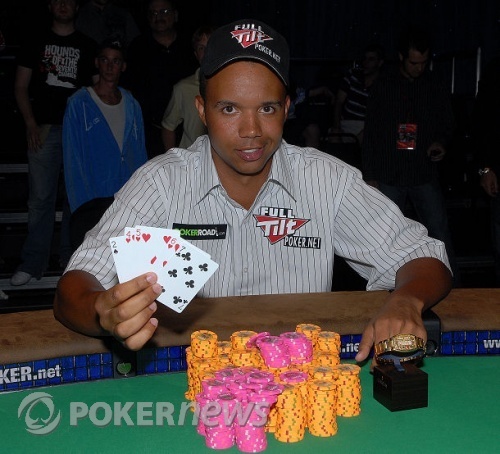 Phil Ivey claims his sixth gold bracelet! Phil Ivey came into today looking for his sixth gold WSOP bracelet. Just over three and a half hours ago, only John Monnette stood in Ivey's way. After a couple hours of heads-up play, Monnette was dwindled down and severely short stacked as Ivey stormed to a massive chip lead. But then, Monnette rallied back with two big double ups to take back the lead. Ivey buckled down though, and grinded his way back to a 3:2 chip lead when the final hand came up. Ivey bested a field of 147 entrants that included some of the biggest names in poker to win his sixth bracelet and further cement his name in poker history. Phil was the crowd favorite and received an outstanding round of applause when it was all said and done. The win netted Ivey $96,361 in prize money and likely earned him a little extra pocket change from sidebets. At the conclusion of the event, Ivey snapped some quick photos with the bracelet and then jetted off down the hall to continue playing the $10,000 Mixed World Championship. Be sure to stay tuned to PokerNews for all the live WSOP coverage! 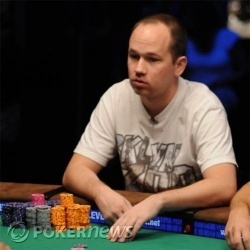 John Monnette raised then Phil Ivey shoved all in. Monnette made the call and everyone jumped from their seats. The tournament announcer stated that each player would be drawing one card. Monnette was first to show and revealed a paired seven. He would be drawing dead against Ivey as Ivey rolled over a . Monnette was covered in chips by Ivey and that was it, he would be out in second place, earning just under $60,000 for his finish. The two players are trading blinds and antes back and forth, but nothing bigger than that is happening. Jean-Robert Bellande, Paul Darden, and Court Harrington are here to witness the action. Phil Ivey raised to 45,000 from the button. John Monnette reraised and Ivey mucked. John Monnette raised to 43,000. Phil Ivey called. Ivey drew one and Monnette drew two. Ivey placed a bet of 90,000 in the middle and Monnette folded. John Monnette raised to 43,000. Phil Ivey reraised to 80,000 and Monnette mucked again. The three-bet seems to be working for Ivey. Phil Ivey raised to 45,000 and John Monnette called. Monnette drew one while Ivey drew two. Monnette checked and Ivey checked. Ivey paired and Monnette's king low scooped the pot. John Monnette raised to 43,000 from the button. 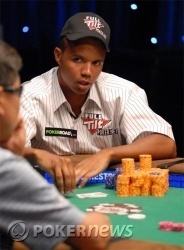 Phil Ivey reraised to 80,000 and Monnette mucked.